According to the Asian Lunar Calendar, but this is now celebrated on January 15. A Chinese lunar month started with the new moon. An older Japanese system had a lunar month start with the full moon. 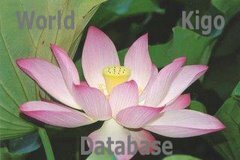 This makes allocations for kigo quite difficult, especially for the New Year kigo and celebrations on our present January 15. Most decorations for the New Year are burnt on this day, as it marks the end of the New Year Celebrations. Now the womanfolk can start to relax, they have been busy with all the New Year preparations, like cleaning the house and preparing food for the family and visitors. 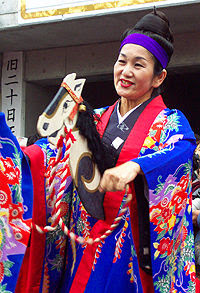 In Okinawa, this day is celebrated with colorful parades of the ladies, called Juriba sunee ジュリ馬スネー, sometimes on January 20. "Michi Junee" consists of a parade of men and women wearing traditional Ryukyu costumes accompanied by sanshin shamisen and drums. The parade will be led by a group bearing colorful flags and a god called Miruku (Miroku Bosatsu), who is believed to visit Okinawa on New Year’s Day from across the sea, bringing happiness to the island. Also, a vibrant eisa performance and various Ryukyu performing arts will top off the New Year’s event. New Year is the largest, and perhaps the oldest celebration in Japan. Having both religious and secular associations, it is much like Christmas in Canada. 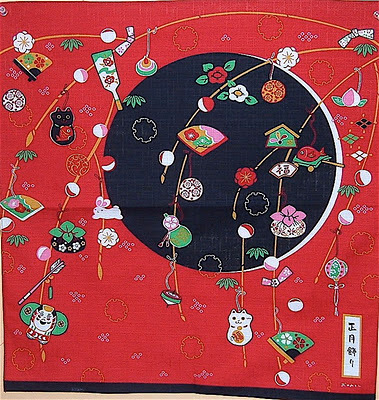 In A.D. 604, the lunar calendar used in China was adopted for use by the Japanese government. This calendar had both a lunar component which regulated civic events and a solar component which was used for agricultural purposes. The new moon marked the beginning of the official months but date discrepancies existed between official celebrations and folk celebrations. Using the lunar calendar the New Year was to begin at the second new moon after the winter solstice. This was the "Great New Year" or shogatsu. At the full moon two weeks later, there was another celebration called "Little New Year" or koshogatsu. Traditionally, these dates would occur sometime from the end of January to the middle of February. However, when the government adopted the Gregorian calendar, shogatsu became associated with the first day of January and koshogatsu fell on the 15th of January.
. mogura-uchi 土龍打 ( もぐらうち) "hitting the moles" . The first Eisa dance festival was held in Naha City in Japan's southernmost prefecture of Okinawa on Sunday. Eisa is the island's unique folk dance. 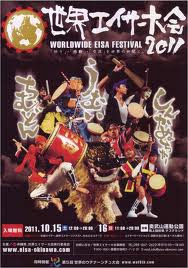 The Worldwide Eisa Festival 2011 was held to coincide with the 5th Worldwide Uchinanchu Festival, where people celebrate their ancestral roots in Okinawa. Local people and the descendants of emigrants from Okinawa danced at the prefectural stadium. third-generation descendants who have danced at events in Sao Paulo. The team leader, 21-year-old Tadashi Nakasone, made his first visit to Okinawa this year. His grandfather was from Okinawa. He began practicing Eisa dancing 10 years ago when he became interested in Okinawa's culture. Nakasone said he is happy that he can express his love for Okinawa's culture through his performances. He said he had a wonderful experience on the stage that was almost beyond description. Dancers from Los Angeles and Hawaii also took part in the event.
. Temple Hokke-Ji 法華寺 Nara .